OANDA is one of the pioneers of online trading in the world. The company was founded in 1996 by computer engineering professor Michael Stumm and Dr. Richard Olsen, a specialist in econometric research. 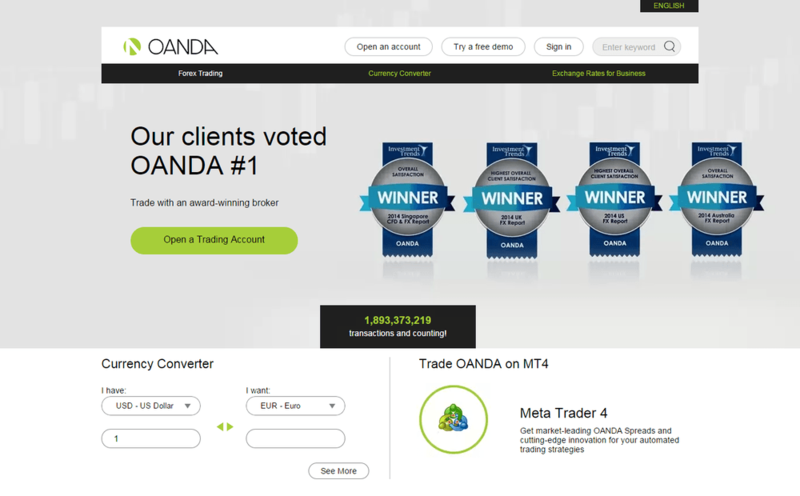 OANDA offers two trading platforms MetaTrader4 (MT4) and FXTrade WebTrader. FXTrade has simple but efficient interface and fast execution speed. According to OANDA, the platform executes deals in less than a second. The platform has the function of charts plotting; traders can test their trading strategies, view financial news and market analysis from leading news providers. transactions. Tech-savvy traders can build their own automated trading systems with the help of OANDA FXTrade API. The line of trading assets includes currency pairs, indices, commodities and bonds, CFDs and precious metals. The good news is that OANDA does not require the minimum deposit to open an account, leaving the decision up to traders. This is especially attractive to those who are not ready to invest a lot of money. The company has one standard account category. The broker offers floating spreads. For the EUR/USD pair, the spread is 1.4 pips on the whole, which is the average in the industry. Spreads for indices start from 0.5 pips. Clients can make use of commission-free trading as OANDA does not charge commission for its services and for maintenance of accounts. The broker’s earnings come from spreads. Traders can learn with the help of video training and webinars. They can monitor up-to-date financial news and experts’ analysis of market trends. In addition to this, traders can take advantage of the economic calendar and articles about Forex, which can be interesting for both newcomers and professional traders. The client support service is available round-the-clock from Sunday (13:00 EST) until Friday (18:00 EST). For more efficient communication, clients are offered to choose the product with which they have difficulties so that they are automatically connected with the right specialist. Traders can ask their questions by phone, email, fax, chat or by visiting the company’s office in the US, Canada, the UK, Tokyo, Australia, or Singapore. OANDA is regulated in six countries by local regulatory bodies – NFA, CySEC, ASIC, CFTC, MiFID, and FCA. The popularity of the broker among traders is due to the option of automated trading, absence of requirements for minimum deposit and trading volume. no commission for account service. Opening an account at Oanda in 2014 was one of the best life choices I made. They have sophisticated platforms which runs smoothly. They don't have a minimum deposit requirement which makes them accessible to all levels of traders. With my almost 5 years of trading with them, I have always been assisted by the support team when there are problems. And they make sure to always address the issue right away. I've already made many withdrawals and they are always transferred within the day or until the next day. My overall withdrawal is approximately over $20,000 already. No regrets trading with this broker at all. I trade with OANDA almost two years after a friend recommend it to me and I think this is the safest broker I have ever traded with. The platform MetaTrader 4 works fast in execution and easy operation. Last time I deposit about $200 with the system Skrill and the profit more then 30% instantly credited to my trading account without any hidden fees. The withdrawal process very commendable and easy to process using web platform or mobile application too, so my money was transferred to my account less then 24hrs. I will suggest all of my friends to try trading in this broker. I've used 4 brokers Oanda is the only honest broker I have been with. Actually I switch Oanda because customize EA did not work properly but with them I got a good result. I set my EA on the MT4 terminal and I earned $463 profits within one and half months. Beside this their spreads are tight, order execution with the use of customizable default bounds minimizes slippages. Also they are very fast in terms of withdrawal. Last week I withdraw $280 from my profit and comes to my wire transfers account within 5 hours. I would recommend it to anyone. I am dealing with OANDA since last year and I think they are reliable broker and overall my trading process no complaints so far. I like their services on MT4 platform. The platform works fast in execution with real time prices, I trade with them currency pairs EUR/USD, GBP/USD, USD/JPY, and Gold. No minimum account size, low leverage and they provide very fast trading execution of trades. So far I didn't had problems during deposit until withdraw money and it took less then 5 hours to get money in my account. I also invite my brother and friends to join trading in OANDA, I recommend them to customized an EA in every trading because my customizing an EA I got profit about 45% to 75%. I am very satisfied with OANDA, this is the best broker. When I joined Oanda I first went to their education center, and the webminars were really helpful. I was trading with another broker which didn't provide much satisfaction because the platform was having delays, but with Oanda I never had this problem. The platform MetaTrader 4 works fast in execution with real time prices and I never had delays. I am a day trader with short-time positions and about 40 trade per week and my profit is 300-400$ a month. To withdraw is easy and it takes around 24h to get approval. OANDA is a reliable broker to me, because since I started to trade with them until now I feel their platform MT 4 works fine, It always offer smooth and mostly order is executed very well. Last time I deposit about $75 and I made $55 profit. Besides, I like their trading platform because it support my trading with mobile application in my Android every where I go because it easy to bring my devices and read news also analysis even though I’m at outside from the house. So where ever I go, I still can keep an update and make a right trading strategy. OANDA give bonus and about 40% profit in every trading process and this broker also provide very fast and nice trading executions as well as their withdraw process. I recommend it! OANDA is an excellent broker and I had a lot of good experience with this broker and their service. I fell easy to trader with them using their super-fast platform that process every order easily and fast. I also like this broker because I can make very minimum deposit without a limit and they had bonus offer which 30% in every deposit. Every time I get excellent service that make every trading process run fast and accurate. I complete my withdraw process about 4 hours and I can do it via wire transfers. I can also trade by their mobile apps or web traders from anywhere, so I think they a highly recommended broker. They support wire transfer for only $20 and they have a very nice platform. They also support all of the operating system including in the mobile and tablets. I would say they used to have really good spreads that go as low as 0.8 pips for EURUSD during a certain period The staff has always been good to me..I highly recommend them and hope they continue accepting US clients! For 6 months of trading with Oanda, I learned a lot and experienced to be a better trader. My account number is 4235615 and started out with $100. Everything went fine and even my account manager has been very helpful and professional. The trading conditions were good and never got any requotes. The withdrawal and deposits are fast and I used Bank transfer so it can process quickly. I increased my funds to $550 now and so far my trades are doing better because their platform and charts are fair.